Be the first to share your favorite memory, photo or story of Alberta. This memorial page is dedicated for family, friends and future generations to celebrate the life of their loved one. 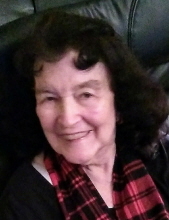 Alberta Louise (Schmauder) Contreras passed away peacefully January 10th after a short health battle. She was 91½ years old, had a sharp mind, and looked decades younger. She was a wonderful mother, and grandmother, and a friend to so many. She never met a stranger, and was filled with compassion for those she had just met. She was timeless, and beautiful both inside and out, never without a smile. To most of the grandchildren she was “Darling” instead of “Grandma,” the oldest granddaughter heard Papa call her that – and the name stuck. It fit her so well. She was our “Darling” and she will be so missed! Alberta loved twirling. And she started early. She could be seen practicing during recess at her grade school. By age 11 or 12, as a child prodigy, she would travel with a band leader to visit area grade schools where she would be the program for school assemblies. In 1941 her family moved to McMinnville where she continued her baton twirling, and during junior year came in second at state. Her senior year she won the Oregon High School Baton Twirling Championship by defeating the defending state champion at the Salem event. At the 1945 Mac High Homecoming game she put on a performance twirling fire, throwing it up as high as the telephone poles and catching it in the dark. The school board had to first vote to allow her performance. She also recalled entertaining the troops during World War II at Camp Adair, and putting on a fire baton show for a State Fire Marshall gathering in Salem. Alberta worked hard all her life. Her main pre-married job was selling theater tickets from her stand-alone ticket booth at the Lark Theater, as well as working at the other two downtown theaters. She also did tailoring at Miller's Department Store doing the work in what is now the Sage Restaurant. She was a dental assistant in a dental office above the now Cabana Club, and worked in the bean fields too. She made most of her clothes and her children's clothes, and was quite the seamstress. Whenever she would look back and tell stories she always seemed to remember exactly what she was wearing in each story – even as a child. She didn't have a photographic memory - she had a fabricgraphic memory! As an adult she taught baton lessons, leading Alberta's Yamhill County Twirlettes in local parades. They were good! When they marched you'd only hear the sound of one foot hitting the ground. In a Portland parade her group even beat the Army Drum & Bugle Corp. in Precision Marching. She first met her future husband Ruben in 1945 at the little red Home Grocery store by the railroad tracks in McMinnville near her home. In a “meet-cute” scene right out of a movie, she said she really didn't mean to drop the butter, which Ruben happily picked up for her. He couldn't speak English, and she couldn't speak Spanish, but somehow the moment was so magic that she went home and told her folks that she had met the man that she would marry. Ruben, a fifth year medical student at a prestigious military medical academy in Mexico City, had heeded President Roosevelt's request for Mexican workers to help with the war effort. Ruben, stationed in McMinnville, worked on the railroad tracks, a vital wartime infrastructure. After his wartime commitment he went home to Mexico, but because of Alberta he would return to the U.S. Meanwhile he learned English and they corresponded along with Ruben's few in-person visits he was able to make from California. On September 13, 1948 they were married in Santa Maria, California where he was working at a hospital. Soon they would return to McMinnville, where Ruben is believed to be the first Hispanic person to take up residence in Yamhill County. He would go on to be a civil rights pioneer for migrant workers alongside future Governor Tom McCall, seeing historic migrant legislation through the 1959 Oregon Legislature. Alberta would be at this side through the years as he worked to defend the oppressed migrant workers and open doors of opportunity. They changed lives in the migrant camps, and wherever they went. They were married 62 years when he passed away in 2010. Alberta spent most of her life as a stay-home mother which included times as a Den Mother, and a Room Mother at school. In the 1970s she invented her special JEZ'REEL Stocking Laundry Bags to keep socks from getting separated, for which she received a U.S. Patent. You may have seen her display at Meier & Frank's in Portland. She also worked at Larson Motors as a pioneering woman car “sales person,” a term new at the time. She would go on to start another local business called Posey Pens where she turned floral arrangements into writing instruments. In about 1965 Ruben and Alberta started driving the family from McMinnville to Portland's inner-city Maranatha Church. They were the first non-black family to regularly attend what would become a widely known integrated church, and the regional, if not national model for the modern day contemporary church service. During the Maranatha years she started a bible study in her house that drew an unusually large number of local young people seeking the Lord. Her focus was on the Lord, and her spirit was always youthful. The young people saw it and were drawn to her love and acceptance. Alberta believed in miracles. Her faith was strong in Jesus Christ. She got to receive one of the best documented miracles when her badly broken arm was suddenly healed. Dr. Nelson had told her that her arm simply wasn't healing and unlike her friend Roma's breaks hers was not a simple break, he made a drawing of the break, and told her it was “a bad break,” not healing - yet three days after being documented by Xray as being in this badly broken state, it was suddenly not broken. After prayer and instruction by Maranatha Pastor Wendell Wallace that if Ruben took the step of faith to cut off the cast – a huge leap of faith for a man schooled in medicine – it would be healed. And it was! As Dr. Nelson's nurse said later, “there was NO doubt” that it was dramatically healed! Alberta is survived by children: Maria Elena Balcom of Spokane, Carl of Salem, Albert Rene of Chicago, Mariettta of Monitor, Oregon, and Ruben Jr. of McMinnville; a brother Carl Schmauder of McMinnville; 25 grandchildren, 19 great-grandchildren - 44 grandchildren in all. She was preceded in death by her parents, her husband, and five brothers: Johnnie, Jimmie, Donald, Donnell, and “Baby” Schmauder, two sisters: Zoe Walters, and Maxine Schmauder. A Memorial Service will be held on Saturday, January 26 at 1:00 p.m. At First Mennonite Church, 903 SW Cedarwood Ave. in south McMinnville, across Hwy. 99W from Linfield College, right behind 7-11. To send flowers or a remembrance gift to the family of Alberta Louise Contreras, please visit our Tribute Store. "Email Address" would like to share the life celebration of Alberta Louise Contreras. Click on the "link" to go to share a favorite memory or leave a condolence message for the family.